Recently, I’ve had a few hitting lessons during the week where we have to hit at an outdoor field with lights because it gets dark too soon. At this field, there are two nice tunnel hitting cages, and the park rents the field and facilities out to local leagues for use (By the way, this park was paid for by public taxes). Unfortunately, the cages are locked even when there isn’t a team practicing. 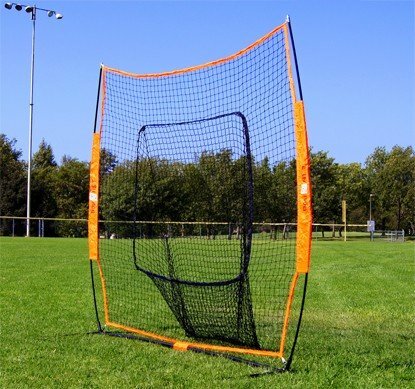 So, what is a coach, parent, or instructor to do when you show up for a hitting lesson, practice, or tournament and don’t have access to a cage? Take out my Bownet Big Mouth “sock” hitting net of course! Limited Time ONLY coupon code. I was required to purchase about a dozen of these before I could sell them. This was part of Bownet’s distributor policy. So I need to liquidate my inventory. The catch? The following $30 OFF coupon code is only good for 7 orders. I’ll even throw in life-time access to The Truth About Explosive Rotational Power Course for free (a $67-97 value) to each of the seven orders. STEP-2: CLICK HERE for a Step-By-Step video on how to apply the BOWNET30TRUTH $30 OFF Coupon Code to your order. The preceding video link was shot after featuring a ProHammer coupon code that is no longer available, but the process is still the same. STEP-3: Once I receive your order, I’ll send you login access to The Truth Course. You’ll get access within 24-hours. PLEASE NOTE: Limit one coupon use per customer. You don’t want to show up to a field for a hitting lesson or tournament and not have a backup plan for your hitters in case the field’s facilities are unavailable. This deal won’t last long. Only the people on my email list are being notified of this deal. Once the seven are purchased, the $30 Coupon Code and The Truth Course deal expires. It’s featured advertising on MLBNetwork. Derek Shelton, the Tampa Bay Rays hitting coach, is the spokesperson in the video ad (CLICK HERE to see video). Marketing – Big money ads, in the proper places, can lend massive credibility to a defective concept that as a result, users tend to overlook. *This actually has to do with what Neuro Linguistic Programming calls Unconscious Competence. Players simply perform on ‘auto-pilot’. On the other hand, Conscious Competence is being able to instruct someone else to exactly model what you’re doing. Image from Ted Williams’s The Science Of Hitting. We want the hitter’s barrel path to match the plane of the pitch, not chop down OR put an extreme uppercut on it. 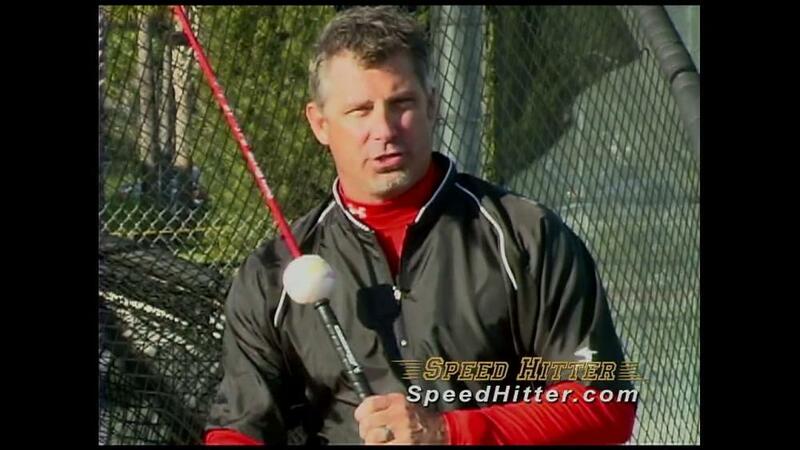 Tampa Bay Rays hitting coach and Speed Hitter spokesperson Derek Shelton doesn’t have an efficient swing himself (wraps the bat in the ad). Addressing #2 above – The main objective of the Speed Hitter is to use the hands to be “short to the ball”. The problem is an efficient swing isn’t focused on accelerating the barrel at the point of contact. It’s before that, if we look at the inverse relationship between turning speed and moment of inertia in Conserving Angular Momentum. 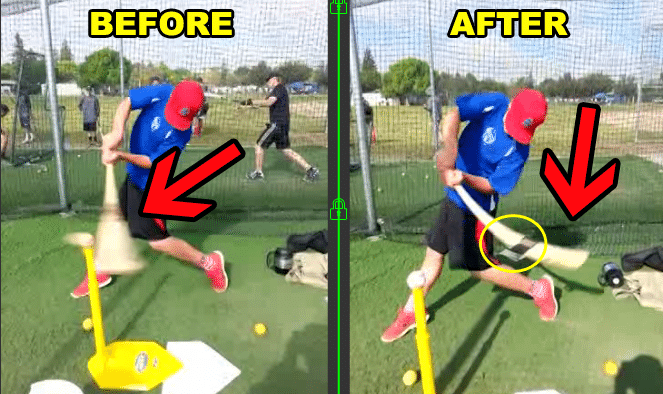 CLICK HERE for the latest video I did on fixing bat drag and the science of turning faster. Addressing #3 above – Being “short to the ball” cuts off a hitter’s ability to get on the plane of the pitch early. Having a barrel on pitch plane early is key, just in case the hitter is late on a pitch. CLICK HERE for a Chris “Crush” Davis post I did revealing “5 Problems with being ‘Short to the Ball'”. Keenan Wolf, one of my H.S. Frosh hitters, after one 45-minute session using a Swing Blaster demo this past summer. Swings are synced. 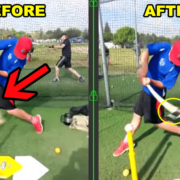 Early Barrel Acceleration – focuses on getting the barrel on pitch plane ASAP. It’s not about being quick to the ball, it’s about being quick to pitch plane. Lengthens Hitter’s Pitch Plane – Gives hitter the ability to hit pitches harder – and keep them fair – that they may be late on otherwise. EIGHT levels of difficulty – there are eight little ‘washers’ that increase or decrease the level of difficulty to hear the audible “click”. 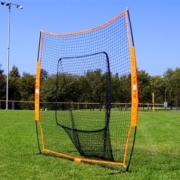 Take soft toss – You can use the Swing Blaster to take short range soft toss. A hitter CANNOT do this with Speed Hitter baseball training aids. DO NOT hit LIVE batting practice with it unless the hitter has good bat control. If the hitter hears the “click” AND contact at the same time, then they’re doing it WRONG. If they hear a “click” FOLLOWED by contact, then they’re doing it RIGHT. Whereas Speed Hitter baseball training aids have it backwards. They want the hitter to hear the “pop” at contact. To be effective, this isn’t when a hitter should be accelerating the barrel. The barrel should already be accelerated at impact. Impact is when a hitter’s arms are lengthening out or adjusting in to increase turning speed or inertial force. https://hittingperformancelab.com/wp-content/uploads/2014/09/baseball-training-aids-swing-blaster-reviewfb.png 394 663 Joey Myers https://hittingperformancelab.com/wp-content/uploads/2018/05/hitting-performance-labs_c90c0362088ef1d3d528f3078f4f8ac1.png Joey Myers2014-10-01 04:53:402018-06-14 03:43:27Baseball Training Aids: Long Slow Swing Fix? Let me be clear about the objective of this article. There are bats, and there are hitting aids. Easton Mako Torq aluminum bats have attempted to fuse both together. This is fine, but the price point is high ($280-550) when compared to a simplified alternative. Key product marketing differentiation says they use “360-degree Torq Rotating Handle Technology”. Easton’s claim is to stop a hitter from rolling their hands over at contact. 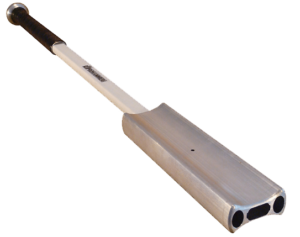 Their launch video says these aluminum bats help to be “short to the ball”, “square up more pitches”, “get to the zone faster”, and “stay in the zone longer”. Is rolling over a big problem? 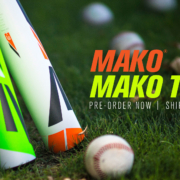 What is a better more affordable hitting aid than the Easton Mako Torq? Coaches use rapid fire “quick hands” toss drills. Point #1 doesn’t transfer to the bigger field, where 95+% of ground-balls are outs. The hands DO NOT create bat speed on their own. They merely amplify energy transfer originating in the torso. Point #3 isn’t practicing like we’re going to play. A hitter has around 20-30 seconds between each pitch, so the goal is NOT how many balls we can hit in five seconds. What Do Cues like Being “Short to the Ball” Really Mean? “Stay in the zone longer”. It’s not how short a hitter can be to the ball, but how quickly they can get the barrel on the plane of the pitch. Easton Mako Torq aluminum bats DO NOT help with this. 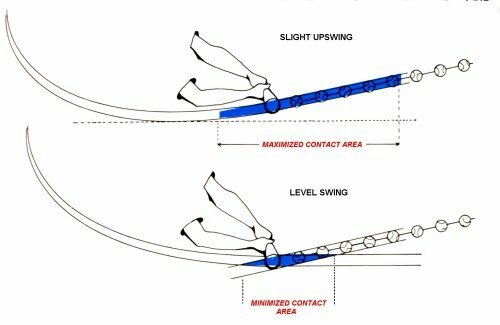 If rolling handle technology can counteract a hitter from rolling their wrist over at contact, then this may be true, sometimes. Squaring up more pitches has MORE to do with a hitter’s timing. Also, where a hitter makes contact in the impact zone can be the difference between hitting the sweet spot consistently or not. 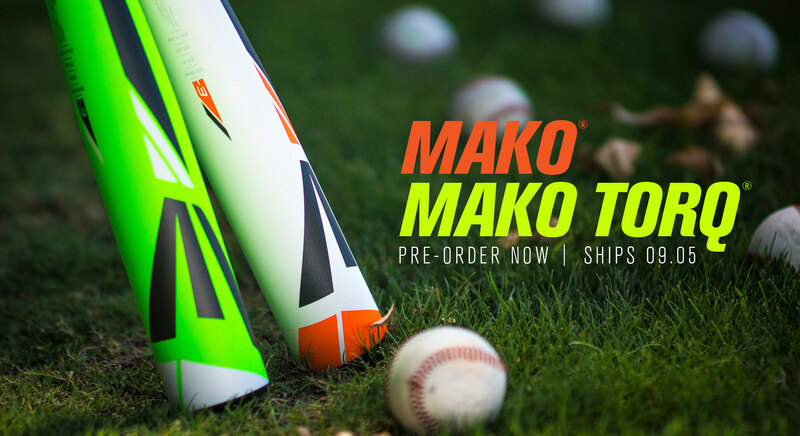 Unfortunately, the Easton Maco Torq DOES NOT help with timing or a hitter’s contact point. Getting to the zone (impact zone I assume) is all about the Conservation of Angular Momentum. Since a hitter doesn’t know which type of pitch, speed, and location beforehand, it’s a race – after a decision to swing has been made – to get the barrel on the pitch plane as soon as possible. In order to spin faster, the hitter MUST stay tight in the turn until the barrel is on plane. Here’s where I think Easton Mako Torq aluminum bats hit the mark. IF – and it is a BIG “if” – these bats can stop rolling over, then a hitter’s “stay through” will get better. But at a price ($280-550). And once the hitter has to swing a normal “one-piece” bat, then I’m not sure if the anti-roll over mechanics would transfer. I don’t see higher levels adopting Easton Mako Torq aluminum bats. Let me be clear, I LOVE Easton bats, and preferred them well over Louisville Slugger’s. However, I don’t agree with their opinion on Torq technology benefits. From what I’ve heard, Easton purchased the patent from a High School player who made the technology, in wood shop class, to alleviate pain in his wrist when swinging. IT WORKED!! If Easton would have marketed it based on that, there would be no discussion. But I feel they stretched the technology truth a bit too much. You be the judge. https://hittingperformancelab.com/wp-content/uploads/2014/08/aluminum-bats-easton-maco-torq.jpg 1200 2200 Joey Myers https://hittingperformancelab.com/wp-content/uploads/2018/05/hitting-performance-labs_c90c0362088ef1d3d528f3078f4f8ac1.png Joey Myers2014-08-22 04:35:342018-07-23 15:50:31Aluminum Bats: Easton Mako Torq MISSED The Mark?